My version is actually fairly similar to what we ate growing up, just with a little more pizzaz. =) First, I take bright, fresh bell peppers, halve them + par-boil them. Then, I make an amazingly-flavorful homemade seasoned tomato rice. Then, I saute up a mixture of onions, ground beef, tomatoes, and spices. Finally, I combine the rice + meat mixture, stuff it generously in those pepper halves, drizzle with tomato sauce, + bake until browned + pipin’ hot. The result? Seriously, the BEST stuffed peppers I have ever had, bursting with tons of flavor + depth. This recipe serves 4-6, but is easily doubled or tripled, if you’re serving a crowd. And if you have leftovers, no problemo – these heat up wonderfully straight from the fridge + freeze great for future meals, too! 1) First, you’ll make the homemade tomato rice. If you prefer, to save time, you can substitute 1 cup cooked/leftover rice (any flavor of your choosing). But it’s reeeally good with the tomato rice, and worth the time! =) If you’re using already-cooked/leftover rice, you can skip to step 3. 2) Make the rice: Heat 1 Tbsp. oil in a medium saucepan over medium heat. Add the rice + stir occasionally until rice begins to lightly brown. Add the garlic, salt, cumin, chili powder, + paprika to the rice, + stir until well-combined, about 2 minutes. Add the tomato sauce, + chicken broth. Bring the mix to a boil then turn the heat to low, cover + simmer for 20 – 25 minutes, until the rice is cooked through + the the liquid is absorbed. Remove from heat + fluff with a fork. 3) Prepare your peppers: Cut each pepper in half, lengthwise. Remove seeds + membranes; rinse peppers (I usually leave the stem attached, as I think it makes a nice presentation). Bring a large pot of water to a boil (just add enough enough water to cover peppers). Once boiling, add peppers to the water. Cook for about 3 minutes, then remove from the boiling water + set aside. 4) Prepare the beef: Heat the remaining 1 Tbsp. oil in large skillet over medium heat. Add the onion and cook for about 5 minutes, until translucent. Then, add in the beef, and cook, breaking up the meat and stirring occasionally, until beef is brown; drain off any fat. Stir in the cooked rice, diced tomatoes and 1 cup of the tomato sauce; cook for just 2-3 minutes until everything is hot. 5) Heat oven to 350°F. 6) Equally stuff the pepper halves with the beef/rice mixture (all mixture will be used up between the eight halves). Lay peppers evenly in a 9×13 baking dish (as pictured above). Pour the remaining tomato sauce around the peppers + drizzle on top of peppers. 7) Cover with foil, and bake for 15 minutes. Uncover and bake for about 15 minutes longer, until peppers are tender, and tops are slightly browned + a bit crispy. 8) Serve hot + enjoy! I am always looking for new uses for ground beef – this sounds great and I bet the kids would love it too. your photograph is awesome, tickle my taste buds for sure…. 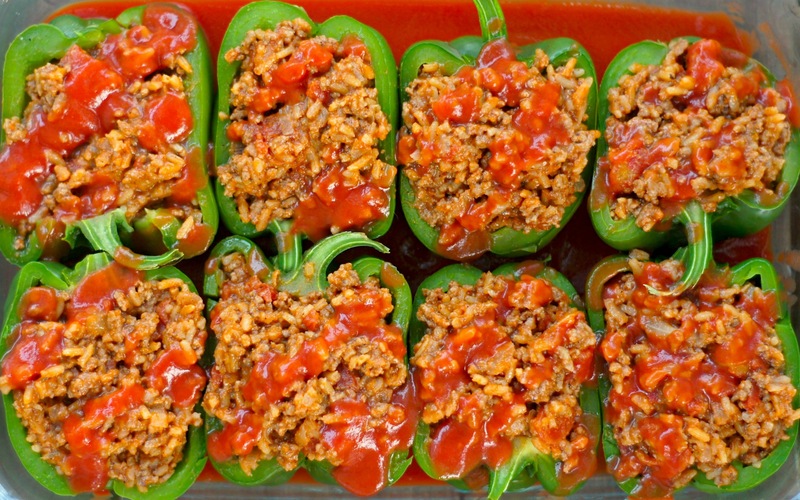 I had no idea you could freeze stuffed peppers – I would’ve never thought of them as a make ahead meal, great to know! These sound great – and by coincidence, I have a stuffed pepper in the oven right now for lunch! I love the suggestion about freezing them, too. What a great time-saver. This looks great! I usually stuff my peppers whole, but I really like how yours look! Will have to try cutting them into halves, for stuffing. I was also a picky eater as I child but I did NOT like stuffed peppers. I’ve only made them once as an adult and did actually enjoy them. I should try yours they look wonderful! these look delicious! i love stuffed peppers but never make them because my husband isn’t a fan. freezing them would be a great option for dinners when he’s not home! Sarah, my husband isn’t a fan either! He’s a pepper hater. =) That’s why it’s so great that they freeze/leftover well. 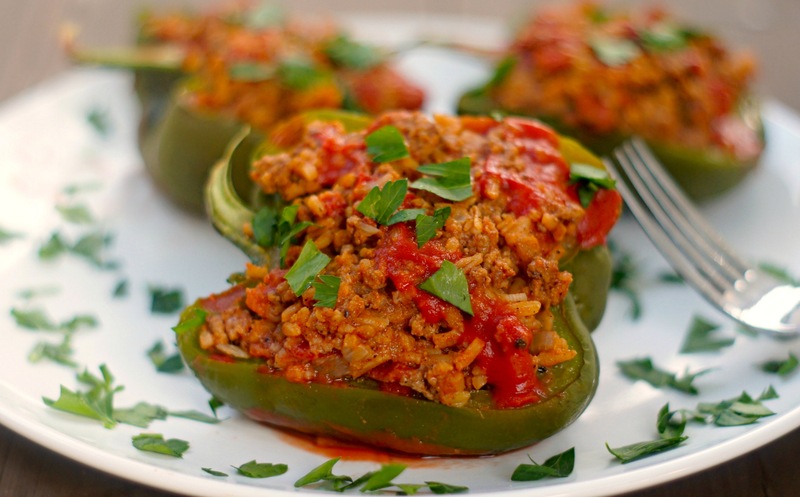 We LOVE stuffed peppers – it is one of our go-to meals during the week. And, we love the leftovers. I am loving that 2nd photo of yours – so creative! Scrumptious! My granny used to make stuffed bell peppers using potatoes and cottage cheese. These look incredible, Amy! I love stuffed peppers – my mom used to make it for us at least once a week. You are reminding me that I haven’t had them in a very long time and I can’t wait to try this version. The flavors sound amazing! I love stuffed peppers – peperoni imbottiti we call them in Italian, and I make them all the time. Yours sound wonderful. I have never used cumin in my filling. I will have to give it a try. Thanks for the inspiration! I’d love to hear about your recipe, Adri! Mine have a slightly more mexican flair, with the cumin and chili. I bet yours are wonderful, as all your recipes always sound amazing! These stuffed peppers look super delicious, Amy! Love the flavours, so amazing. Now planning something similar to this for dinner this next week! Thanks so much for sharing!